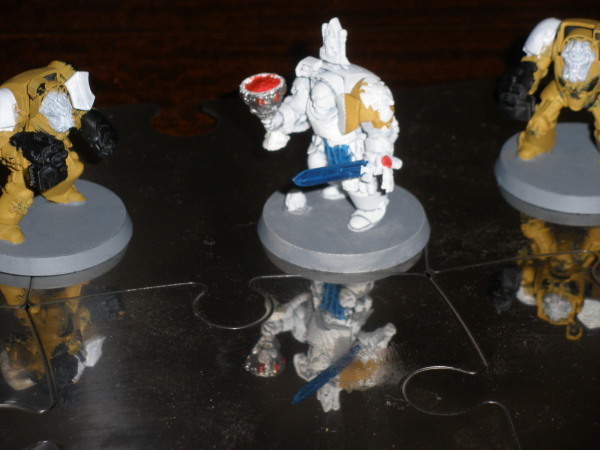 After careful consideration of the parts remaining after the last couple of years of vows, and a few odds n sods here and there, I find myself looking at 3 normal SB/PF terminators and 2 Sergeant models. A full squad this does not make. So now I go and check exactly what I made up previously... And discover that I only need 4 termies to complete my 3 5-man squads. 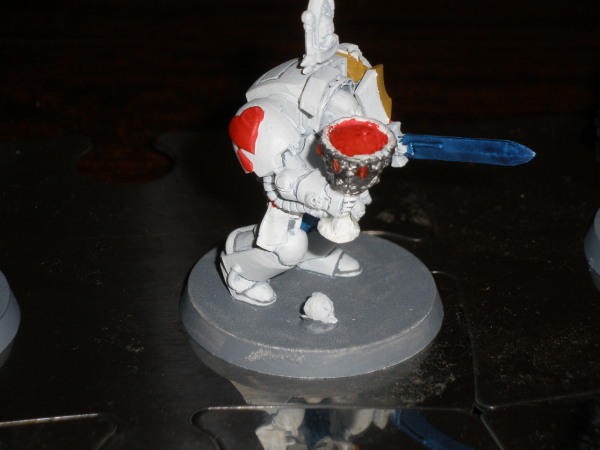 (and still have a spare bod so i can combine without having an additional Power sword in a 10-man unit). So what to do with the second Sergeant? Captain? 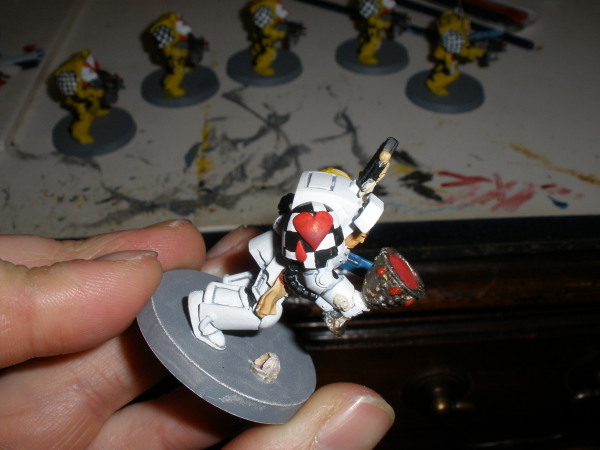 - Nope, got a Red Scorpion for that model, Chaplain? 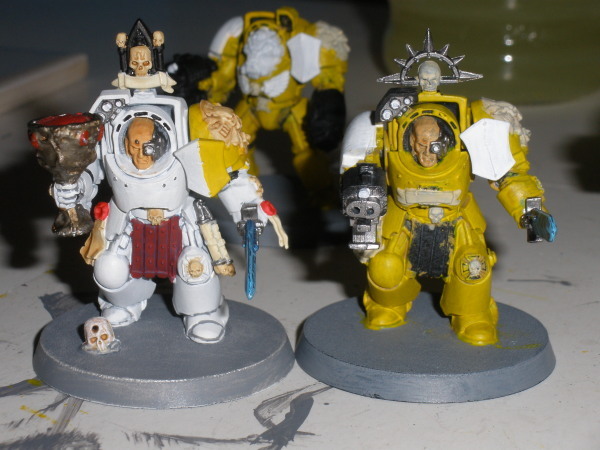 - Nope, not wearing a skull helmet, and I'd need to kit-bash a Crozius too. Librarian? - Nope, already got 6 or 7 Termie Librarians that I dont use. 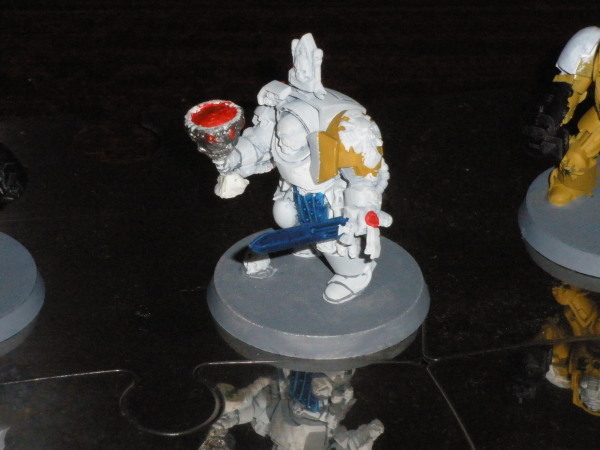 So, This leaves me with a chance to update my first Sanguinary Priest conversion from donkeys years ago - currently armed with a PF/SB using the old 3rd Ed lead Terminator Sergeant model... A Power Sword, and sourcing a nice Grail, and my AoBR Sergeant will look nice and white in his new paint-job. Edited by Leonaides, 03 February 2011 - 05:45 PM. 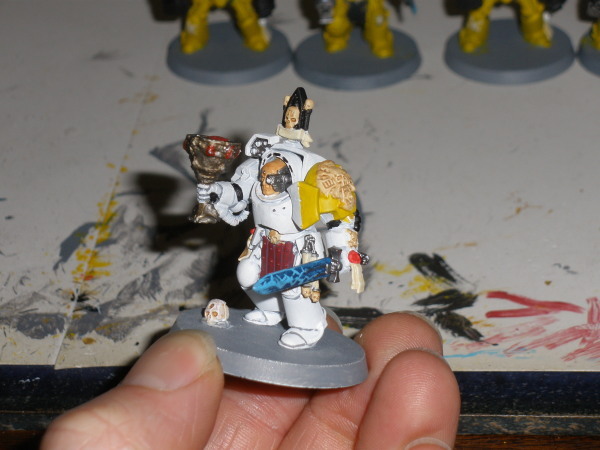 I'm not happy with the blue straps on the priest's waist - so that'll probably change to mechrite red. His shoulder symbol is greenstuffed, but I still need to checker-pattern the pad around it. 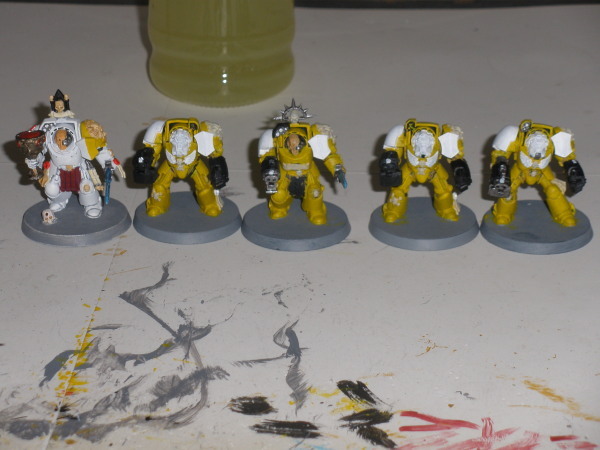 Rest of the marines are base-coated, ready for the first coat of sunburst. End of the month? No problem. Nice blogs. ANd I like the colorscheme and that you went for a less famous canon chapter. 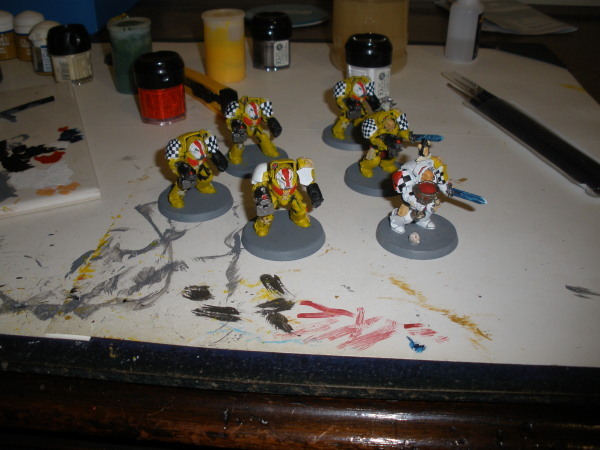 Boxed and finished: Grey Knights and Black Legion. A couple more evenings without the cat eating the end of my paintbrushes and I'm done. 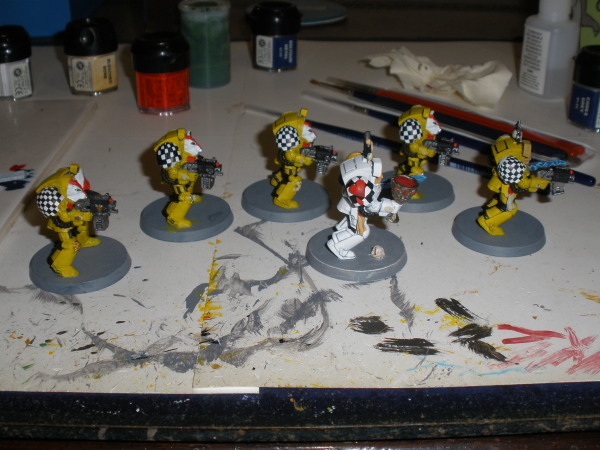 Vow completed - 5 Lamenters Terminaotrs (incl 1 Sanguinary Priest). And who's a numpty? Me! The vow was for 6 terminators - no idea why. 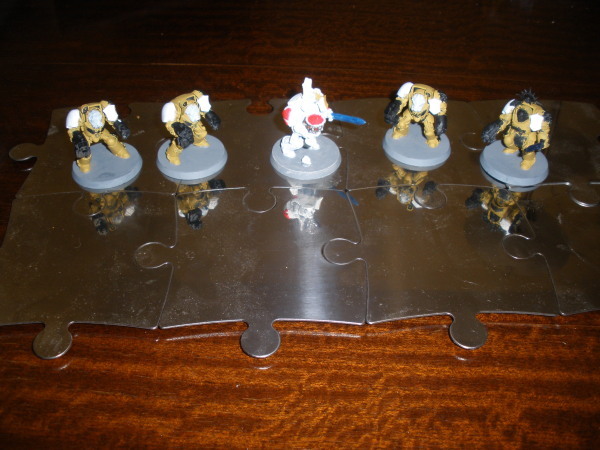 Proof of 6th terminator below (the guy with the white shoulder shield). He does need a little more work on him, but I thought I'd get the pic up now, and worry about the touching up later when he's dry. 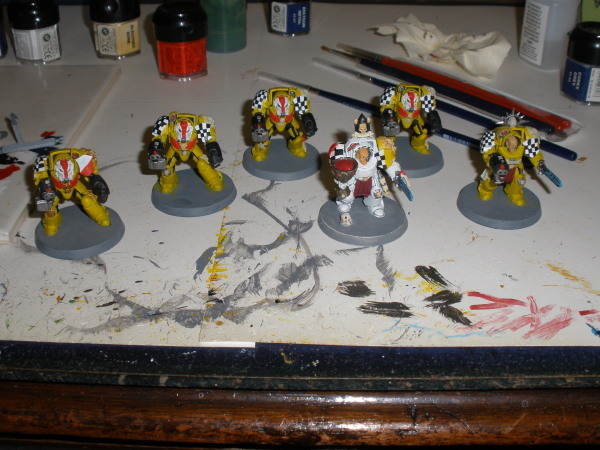 3.5 hrs from undercoating to this stage (with an hour out to go collect my car from the car-doctors).